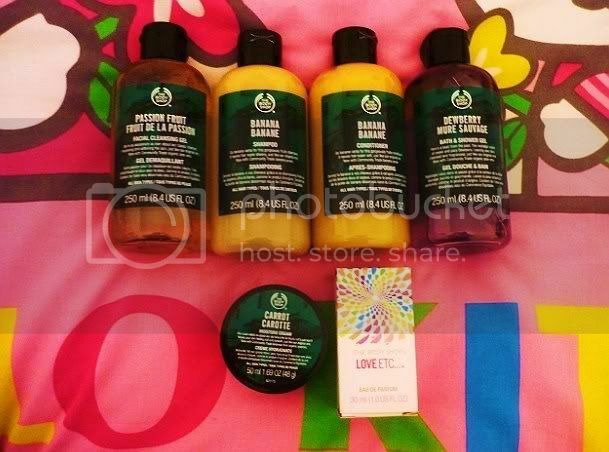 The thing that's so special about the Originals range, as they're The Body Shop's founder Anita Roddick's favourite products from the 1980s - and so being born in 1989, I missed out on all the fun, first time around! I have quite sensitive skin, so I'm always wary about trying new facial products. But this didn't irritate my face at all, and my skin felt bright and glowing afterwards. My only suggestion is that it would work better with exfoliating beads, for that extra scrub! Again, I wanted to try something I wouldn't usually get. I wasn't too sure about it at first - the smell and colour reminded me of the antibiotic stuff you'd get from the doctor's when you were a kid! But when I tried the shampoo, it gave me a lot of lather with just a small amount, and my hair looked shiny and healthy - even though I usually stick to 'volumising' products. I don't use much shampoo, as my hair is rather fine, but I just applied it to my poor split ends and it perked them up a bit. I'd definately recommend the shampoo, anyway! I've heard that this one was really popular during the 1980s, and is the one women are wanting to return the most - and it's got a really fresh, fruity smell! I'll definately use it more when I've gone through my Christmas stash! OMG WHERE HAVE YOU BEEN ALL MY LIFE? This was recommended to me by a friend, and I was a bit cynical because, well, it's carrot! The thing you have with sunday lunches! But it's probably the best moisturiser I've used - it's very thick and luxurious feeling, but doesn't leave a greasy residue on your skin like a lot do. AND - proof that this is a brilliant product. I put this on the night before I had a first date with a rather lovely boy, and he mentioned when we got to the hand-holding part that my hands and arms were very soft. And when was the last time boys started noticing this? EXACTLY! I decided to treat myself to this adorable little purfume. Although I got Daisy by Marc Jacobs for Christmas (more compliments from the boy! ), I wanted something more wearable on a daily basis, so I wouldn't use up the expensive stuff right away, and starting from £12 - this is perfect. Musky and delicious! Have you tried any of the Originals range? Any I should have picked up also? I'm always love hearing from you guys, so please leave a comment or give me an email, the address is at the top of the page! Also be sure to vote on the website, as the winning products will be here to stay! I always liked Tobacco Flower shower gel but I only ever got it once and then never saw it again. =[ That banana shampoo sounds lush though! I picked up the passionfruit cleanser and the dewberry body lotion, i just love fruity smells. Haha, I had a chest infection late last year and got yellow medicine and was all excited thinking it was going to be banana - but it was this rank, bitter lemon! Euch, I was so disappointed!